Celiac Awareness Tour hitting San Francisco this weekend! There's a new snack bar in Gluten-Free Town that can sustain you as an unbelievably healthy quick meal, and it lives up to some amazing claims. 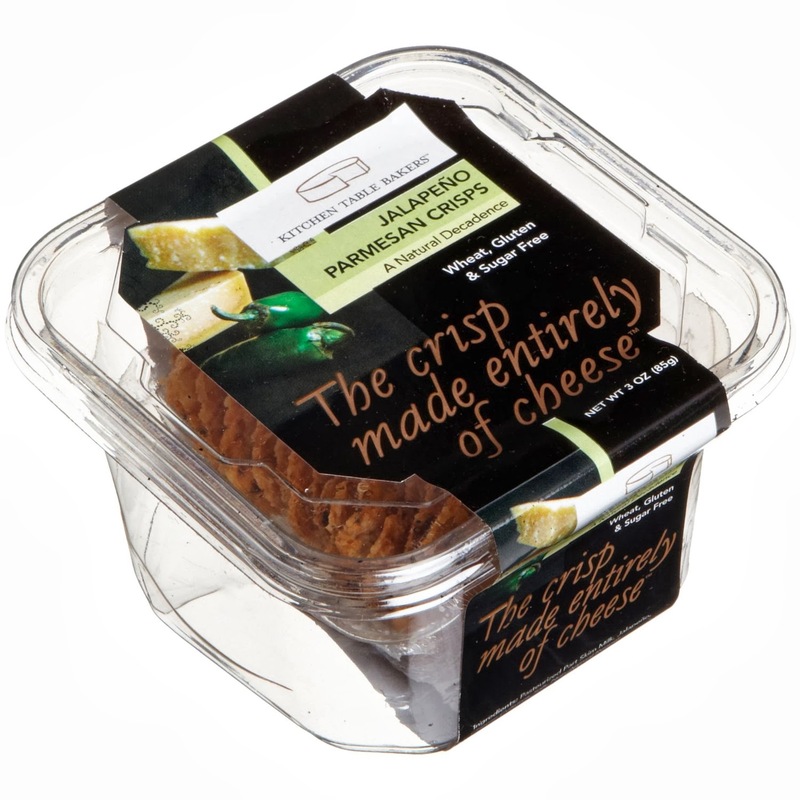 If you eat meat, listen up, because these bars are good. EPIC Bars are: Paleo, gluten-free, low-glycemic, soy-free, dairy-free, nitrate-free AND have a one-year shelf life. 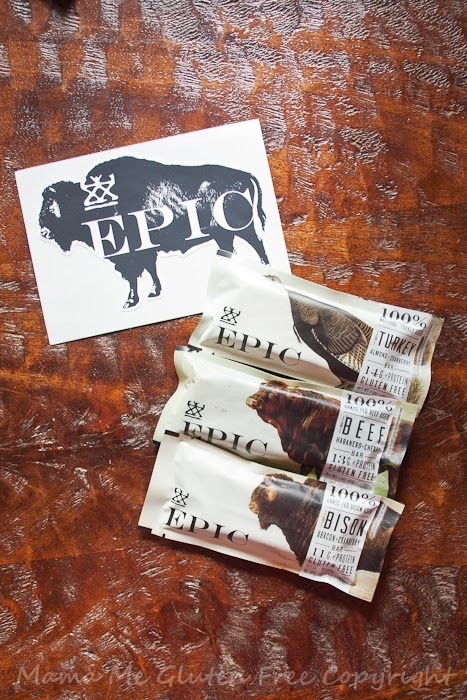 On top of that, EPIC bars use meat from animals that are vegetarian-fed and grass-fed, antibiotic-free, hormone-free and humanely treated. They don't claim to be egg-free, but I don't see eggs on the ingredients of any of the bars. 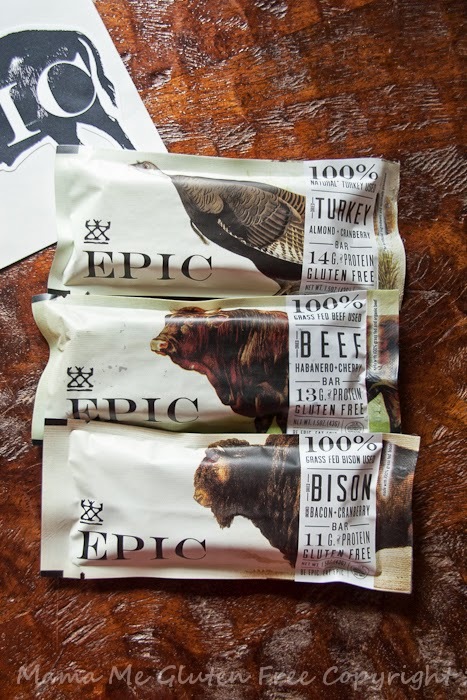 According to EPIC's philosophy, these bars "are loaded with anti-inflammatory omega-3's, muscle-building conjugated linoleic acid, and antioxidant rich vitamins A and E." Touting a decent amount of iron, and between 11 and 14 grams of protein per bar, that's all pretty good stuff. But the best part? 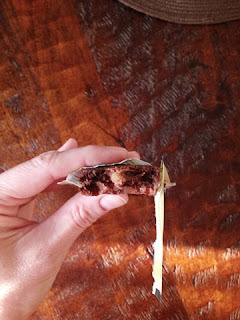 These bars are really, really tasty. 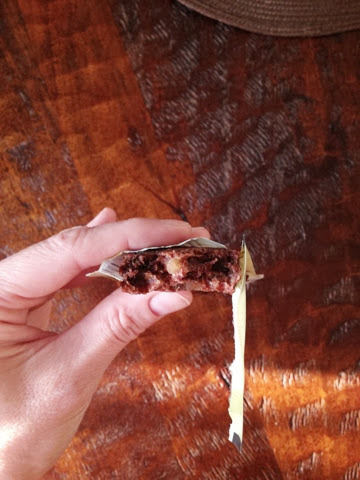 It's been a long time since my husband has had a good gluten-free bar that is high in protein that he loved, so when he texted me a photo of the wrapper of a Bison Bacon-Cranberry Epic Bar someone at work had given him to sample, and expressed his love for it, I knew I'd better get on that. I contacted Taylor Collins, one of EPIC's founders, and he kindly sent samples of all three flavors as well as some information and a cute bison sticker. Needless to say, my husband was pretty thrilled. I think my favorite flavor is the Beef Habanero Cherry, but the Turkey Almond Cranberry was a really close second. 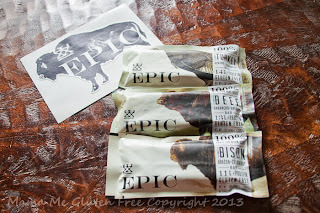 My husband's favorite is the Bison Bacon Cranberry, but he really did love all three flavors. I wish I could vouch for the bison flavor, but I'm not able to eat pork so wasn't able to try that flavor since it contains bacon. I have no doubts it's equally good. My oldest daughter loved all three flavors, and she said they were so good, she wanted one for dessert! The youngest has a more sensitive tongue when it comes to spices, so she said they were a little spicy for her. 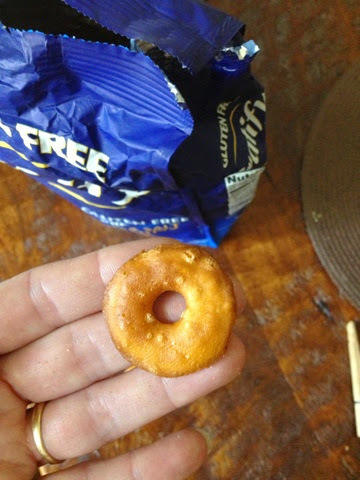 The only thing that took a few bites to get used to was the texture, but it wasn't a huge hurdle. 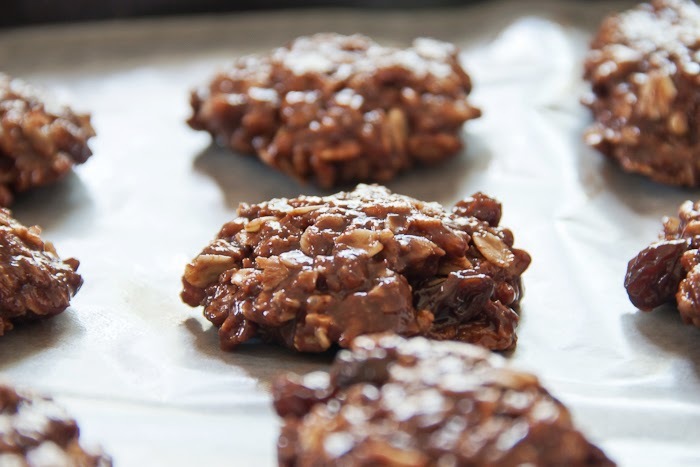 It's kind of a cross between a Larabar and softer jerky. Not quite what you are expecting, but it wasn't an issue for anyone in this family and once I was used to it, didn't mind it all. Bottom line is, these bars are GOOD. 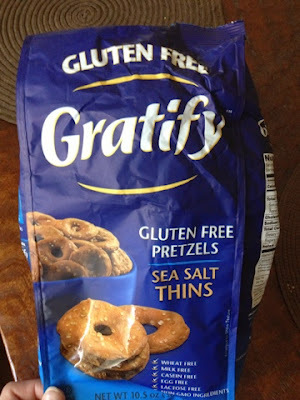 Good for you, good tasting and a good "meal" to have on hand in your emergency supply kit, for trips or for your next outdoor adventure. My husband is bringing some on his desert biathlon coming up. Once again, forgive the phone photos, but I had to share this yummy dish - made once as an experiment recently and a couple of times since - before I have a chance to make it again and take "real" photos. 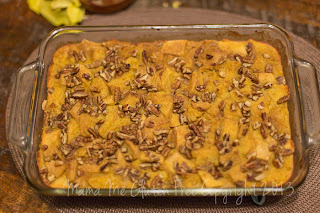 This is the way I intended for the recipe to be made, and it was soooo good, but a little more work. The smaller dishes were the rest of the filling poured into the dishes after I'd filled the squash halves. The second and third time I made this, I cut the squash into strips and put them flat in the pan and just poured the filling over them, rather than try to fill squash halves. 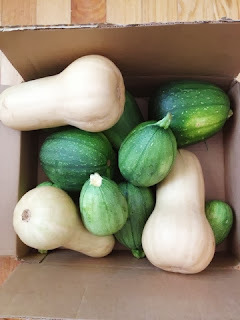 We were recently blessed with a bounty of squash from someone (our garden hasn't been so great, or big, this year) and I was wondering how in the world to fix SO MUCH before it went bad - and make an entire meal of it. Experiments abound in my mind, so this was one of them and we are all glad it was. Preheat oven to 350 degrees. Wash squash and grease large 13x9 baking dish. 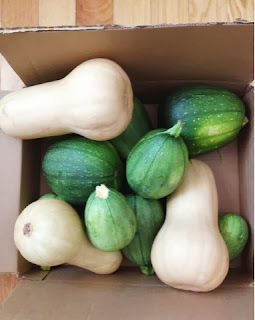 Slice off stems and ends of squash, then cut in half. 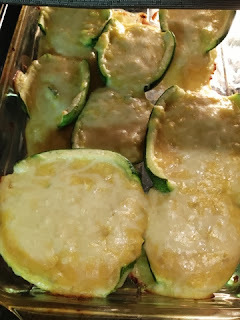 Place squash cut side down onto baking dish and bake about 15 minutes, just until squash insides are getting softer. Bring water for polenta to a boil and prepare polenta according to package directions, then set aside. While squash is baking and polenta is cooking, melt a tablespoon or so of butter over low heat in a large pan. Add chopped onion and saute over medium-low heat. Place the squash pieces that were scraped off into pan with onion and raise heat to medium-high, breaking up squash into smaller pieces as it cooks and softens for several minutes. After squash is cooked down some more and softened, remove from heat. Add polenta and season to taste with salt and cayenne pepper. Add shredded mozzarella and stir to combine. Whisk eggs and slowly add to filling mixture, stirring quickly to prevent eggs from cooking too fast while incorporating throughout filling. Pour filling into squash halves (in which case you will need a couple of greased ramekins to use up the rest of the filling), or over squash strips. Sprinkle a little more mozzarella over the top. 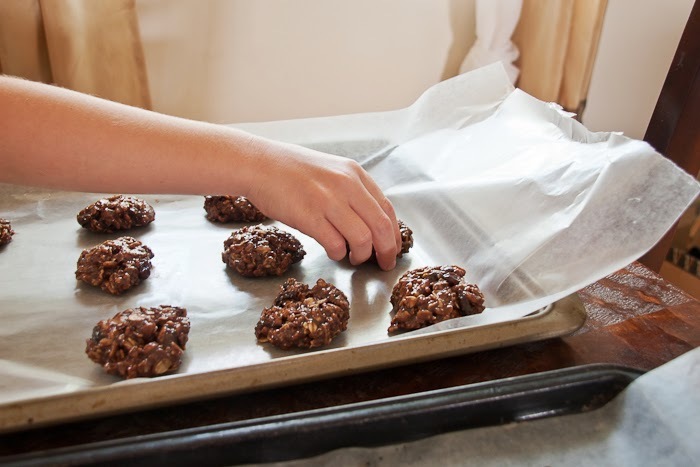 Bake at 350 degrees approximately 25-30 minutes or until filling is cooked throughout and squash halves or strips are completely softened. Are you near Detroit? If so, check it out! 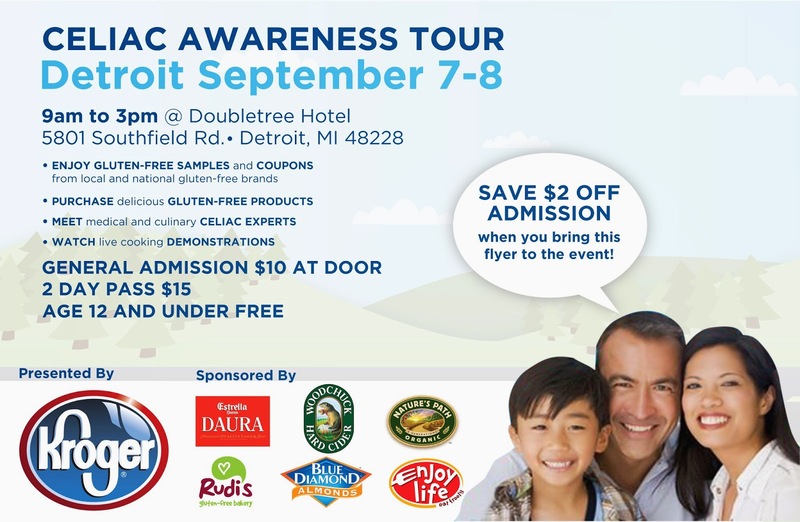 This is a great chance to learn more about the gluten-free lifestyle and sample some products! 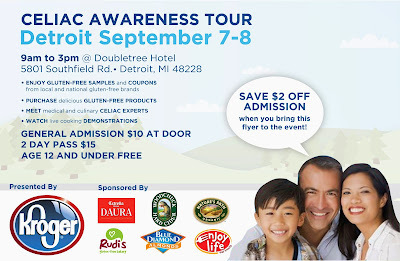 Click on the flyer below to zoom in and read the details about the Detroit event on September 7-8! Sometimes you just want something simple to make up a meal, or need something a little different for a snack. The Parmesan Crisps by Kitchen Table Bakers will do just that. Just Parmesan in the Aged Parmesan flavor. That's it. Cheese. They manage to take cheese and crisp it to a cracker. 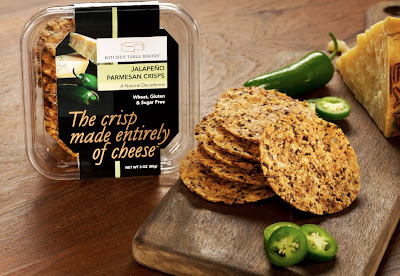 Other good, simple ingredients are added to flavors such as Jalapeño, Sesame, Rosemary, Flax Seed, Garlic, Italian Herb and the final flavor: "Everything." 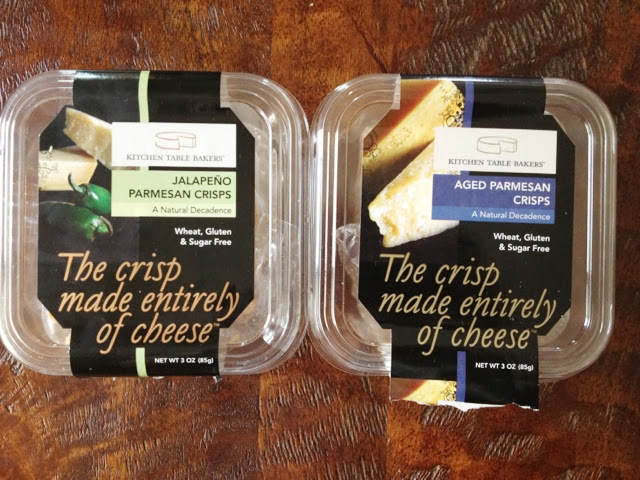 Kitchen Table Bakers recently sent me samples of the Aged Parmesan and Jalapeño to see what I thought. 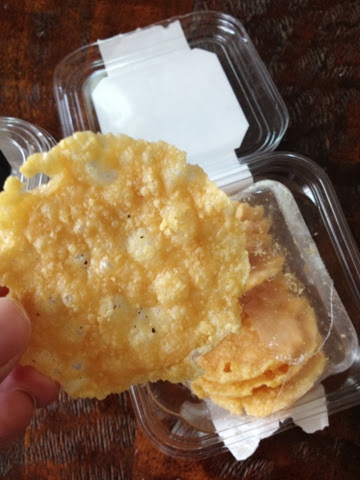 I was pleasantly surprised at how truly crispy these "crackers" were. While the spicy Jalapeño flavor was my favorite out of the two, lovers of the bold taste of Parmesan won't be disappointed in the slightest with the true Parmesan taste both of these flavors provide. I have no doubt the other flavors are the same, and I personally look forward to trying the Rosemary and Garlic at some point. While they may be overwhelming if eaten in a large quantity alone, they are a perfect companion to a simple meal, like the one I made out of these yummy green squash one evening. 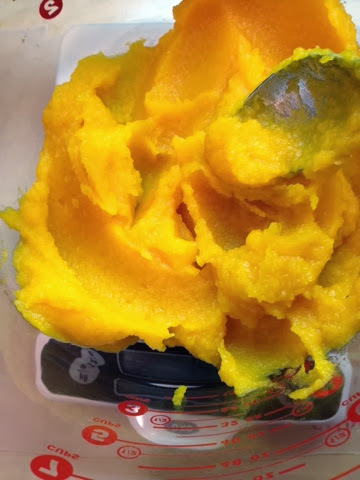 (Recipe for that squash dish is promised for the future.) My daughters and husband agreed. They also make a great snack when paired with other ingredients, such as a slice of tomato or some seafood. 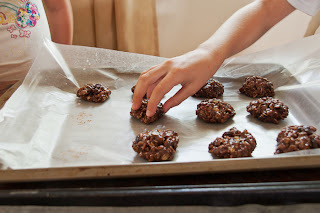 The best part other than the simple ingredients? Of course, they are gluten-free. 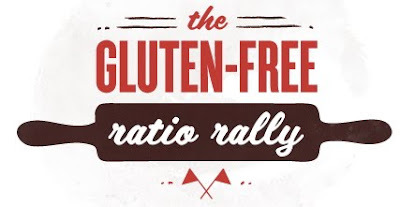 Gluten-Free Ratio Rally Does Tea Bread! 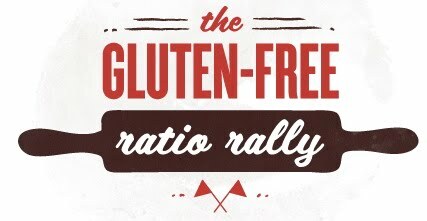 Time for me to post another Gluten-Free Ratio Rally catch-up - eventually I'll catch up to where they are and maybe, hopefully, I'll be able to start baking in the challenges again! The rally participants did tea bread for the challenge in May, and the ever-so-sweet Brooke from B and the boy! was the host for this challenge with her Scottish Tea Bread. 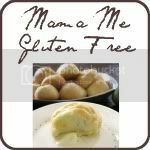 Be sure to check out Brooke's yummy bread, as well as the recipes the other participants baked up for you. 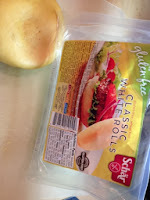 A quick post for you, if you enjoy saving money as much as I do. Have you heard of the smartphone app called Ibotta? You may have - you're likely not as behind the times as I am. I saw a friend posting on Facebook about some purchases she made a few weeks ago - organic purchases, at that - where she got rewarded through something called "Ibotta." After seeing a few of these posts, I was intrigued and asked her about it, and followed the links for more information. My friend informed me that she was indeed earning money back on some of her purchases, and the bonus was it was all fairly simple - or she wouldn't be doing it, she said. You earn money on certain purchases and it's transferred to your PayPal account when you want it to be. I figured it was worth a try - and earned $13.75 to my account in less than two weeks for just redeeming offers on five products I'd purchased. Of course, $10 of that was for redeeming enough offers in my first two weeks, but still. That's a few sno cones or some other little fun treat for the girls this summer. Here's how it works: You have certain products, some of which you're likely already going to buy (Almond milk, anyone? Salad? Coconut water? Organic kids' snacks? Potato chips? Eggs? Olive oil? Lip balm?) ... Then you click on that product through the app, take a little poll or read a little fact or something else that takes seconds ... Then once you've purchased it at a participating store (Whole Foods, Walmart, Target, many grocery and pharmacy chains, dollar stores, etc. ), you click redeem through the app, where it will take a photo of your receipt, then scan the bar code of the product you purchased. It takes just a few seconds (trust me, if it was complicated or time consuming I would NOT be doing it), and some products are worth a few dollars back, some are worth 50-75 cents or more. 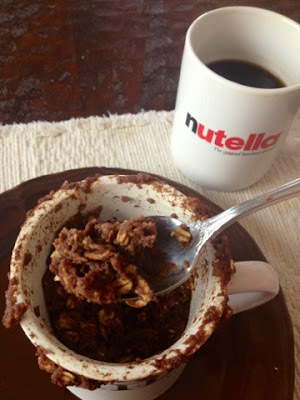 A mug breakfast dessert, of sorts, for you this morning. 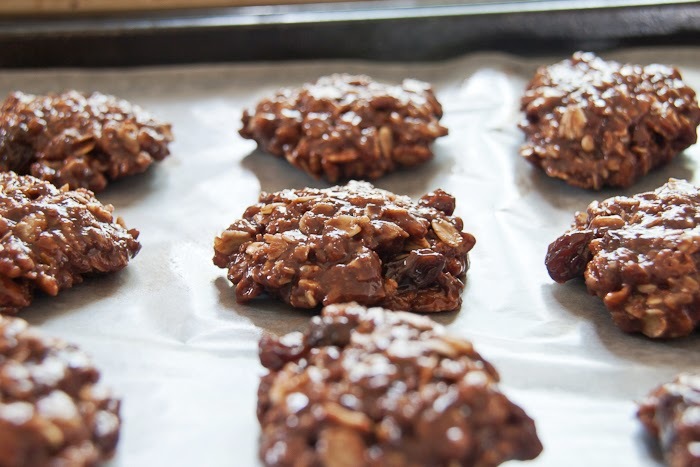 Gluten-free, as always, and dairy-free. Forgive the phone photos. I'm not feeling well this morning. Yesterday I started feeling the scratch in my throat and took every supplement, essential oil and natural remedy I had on hand (properly spaced apart, of course) to avert the illness I felt imminent. My husband came down with a mild cold last week and my youngest came down with a bad cold this week, so I'm hoping it's the first cold and not the latter that I'm fighting. Regardless, I don't feel great. After I slept in for a while, I got up and everyone else had already eaten. So no big breakfast. They'd finished off a pan of oatmeal (certified gluten-free, of course - and FYI - not everyone who eat gluten-free can handle even GF oats so use caution and listen to your body if you're not used to eating them). I didn't feel like cooking or baking. I wanted something simple, single-serving and yummy. 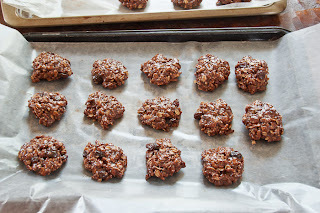 I really wanted baked oatmeal (goodness, speaking of photos! I shudder at my early ones!) or something of the sort but wasn't about to wait that long or give that much effort. 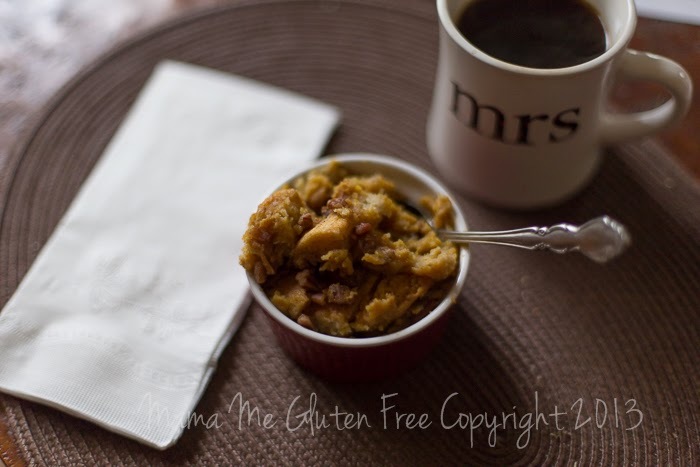 Mug baked oatmeal? You have seen a couple of mug cake recipes posted here, and I have even more I have yet to put up. Some of them include oatmeal in them, but I hadn't tried pure baked oatmeal in a mug-microwave combination yet. I did a quick search to see if anyone else had attempted it yet. Given the way I'm feeling, I didn't want to mess with too much experimenting. 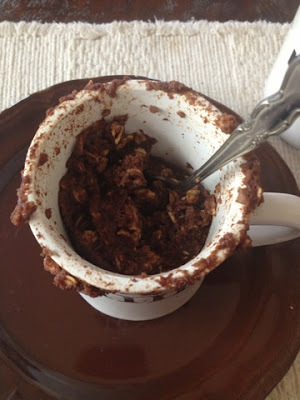 I came across this instant fudge brownie baked oatmeal in a mug and at first decided to not use the cocoa, because I thought I wanted cinnamon. I changed my mind, though, and went all out. I modified the recipe to suit my needs and desires, as you can see below. Was it good? It was exceptional. A word of warning, though - as you can see from the photos, it overflowed from my standard size mug. Because it was a different consistency than other mug cakes I've made, it actually dribbled down the sides of the mug rather than just puff up and then shrink back into it. The Nutella mug pictured next to it below with my coffee would have been a better size for this microwave-baked oatmeal. In the state of mind and all going on in my life lately, I'm likely to be posting more phone photos for you just so I can get posts up. It's really a little ridiculous considering I use my good camera nearly every day and am editing photos nearly every day, to not be taking good photos of my food for you! To be honest, though, I've been going through a lot and my family has been fed grits and eggs, toast and eggs and pancakes for more meals in the last couple of months than I'd like to admit. Thankfully I have an awesome husband and children who must think I even make eggs and grits with a magic hand - or they are just being really super sweet, which is more likely the case. 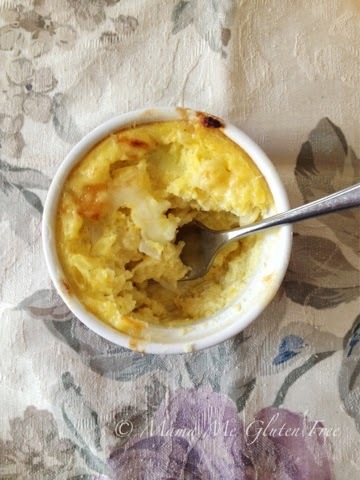 Grease inside of large microwaveable mug and add egg, coconut milk (or milk of your preference), applesauce and vanilla. Stir with fork until blended. 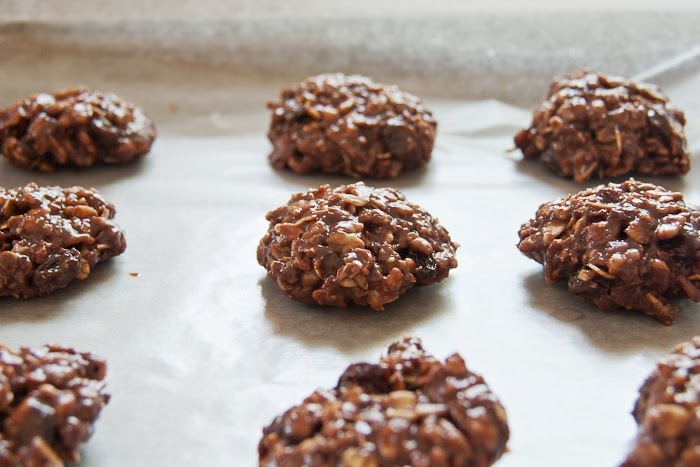 In a small bowl, combine oats, cocoa powder, salt, baking powder and sugar. 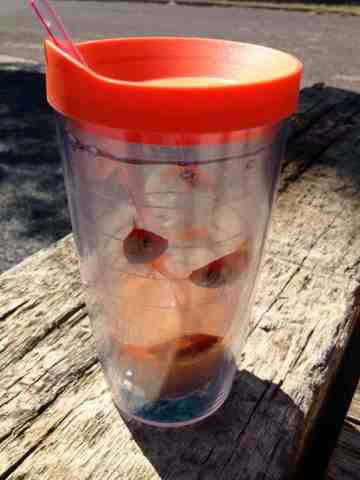 Mix into mug slowly until all is combined. 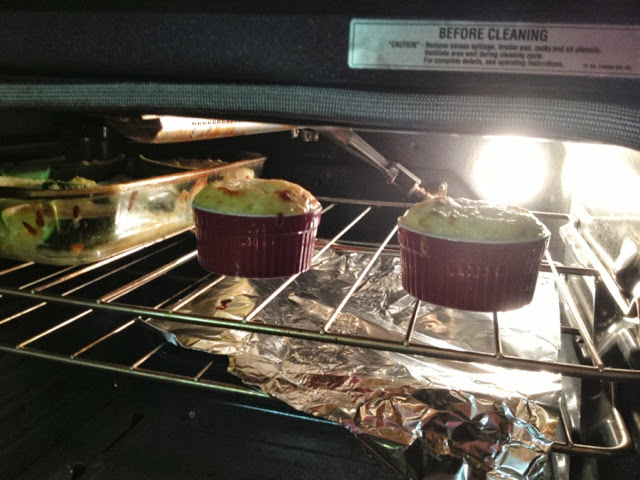 Microwave on high about 2 minutes and 15 seconds or until it's all "baked." We were all in shock yesterday as the events unfolded at the Boston Marathon. When bad things happen, we usually are shocked at first. Then we grieve. We hurt. We cry. We scream, "Why??" We pray. 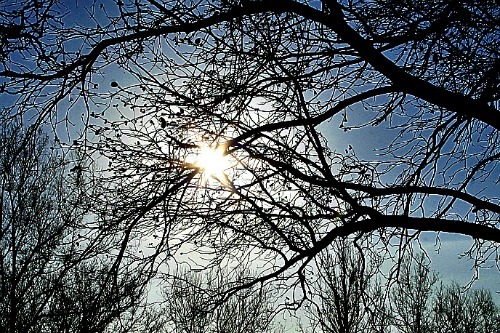 We help, and to quote the beloved Mr. Rogers, we "look for the helpers." Since a few weeks prior to this, I've already been grieving and hurting and screaming about a loss that has rocked me to the very core and has broken my heart into millions of pieces that can't possibly be fully repaired. 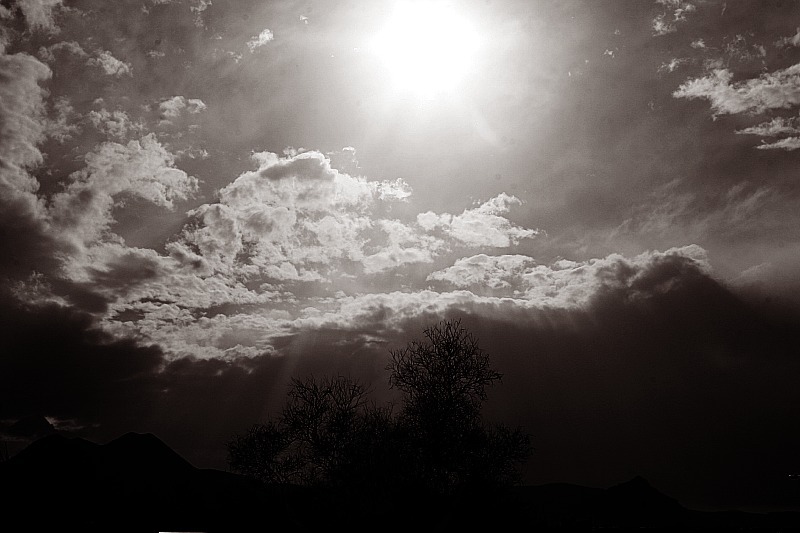 I'll write about that sometime, the sudden passing of my dear kindred spirit on earth. So as I'm already on the verge of tears every second of every day, the news yesterday morning that a beautiful blogger named Kate of Chasing Rainbows said goodbye to her son that so many of us had been praying for - it seemed like more than anyone could bear. And then the explosions at the Boston Marathon brought yet another tragedy into more lives. It's too much. It's all too much. And I look for the helpers, and I look for ways to help. Whether that's donating money to charities providing aid, or directly to families, or being a shoulder for someone to cry on or cry with, or an ear to listen, or writing a note, or praying. Or doing more. Or all of the above. There is something I can do, no matter what my strength. Something you can do, no matter what your strength. Cherish those you love, and let them know. Squeeze them tight and make some memories.